I definitely like the original way better... I saw it in a shop at the Chicago airport and bought it, picking it up first because I thought the cover was cool. Not sure I would pick up book with the new cover - looks more like a romance novel, then what it really is. I don't like the new cover at all, but I am glad they moved away from the desk. The old cover fits the book perfectly, but it's also like a big huge spoiler. I guessed the mystery very early on, and I think that was in large part due to the cover. Talk about going from bidet to hole in the ground. Small Review: Oh, sorry that you felt like the old cover was too much of a spoiler! That stinks. I guess because when I was told about the boo, the person told me what was up with the desk, so for me, the real mystery was in where the messages were coming from, and what happened to the missing people. I wish publishers would realize that all books don't need a cute couple on the front ... although if I put the two books next to each other on a table, I'm sure teens would probably pick up the new cover more. It's all about marketing to as many people as possible. I love the hardcover version....it looks like a Lisa McMann book, keeping with the themes of the Wake trilogy. The paperback is just...bleh. Generic shadowy romance. Nothing special. Why do they even bother changing cover designs, when the first cover is so amazing? WHY?! Frankly, I don't like the new cover at all. The original is simple but so creepy... I love it! I agree with Annette, the original cover was so much more appealing to me. The couple of the cover is just like every single other book on the shelves, just doesn't stand out. Oh yes. The first cover is really creepy. But I guess they want to attract more people to buy it. Personally, I would buy the first one. WHAT. THE HELL. Doesn't match the book AT ALL. AHHHHHHHHHHHH. And isn't Niko supposed to be Mexican? The guy on the cover is NOT. Also, i didn't picture the MC that way at ALL. No. Not a fan of the new cover. Too similar to too many others and doesn't fit the plot at all! What?! oh come on! this looks like the cover to a cheesy adult romance!!!!!!! New cover = Harlequin romance. Which is not necessarily a bad thing, but is also not at all this book. I don't like the new cover very much, but I'm absolutely in love with the old one. So creepy. I also kinda like the UK cover, (http://www.goodreads.com/book/photo/11291489-the-missing) which is under a different title. I like it because the girl looks like she could possibly be dead. Because I've read the book, I think it's a bad change because the desk is so important to the story! I think I would have just skipped reading it if that were the original cover. Hm. But maybe it will draw in some new readers. I really dislike it, but if more people read the book I guess it's a good thing. Boring, boring, boring. Definitely a downgrade. I've never read the book and the new cover certainly doesn't make me want to. It seems like your run of the mill romance/YA book. HATE!!!!! The new cover for so many reasons. It makes it seem like its a romance - it's not! Makes it look all girly - it's not! I'll never get boys to pick up this cover!!!!! Makes it look all sweet - it's not! Hah, okay, I guess I'm probably in the minority who likes the new cover. To be honest the original cover is way too creepy for me. 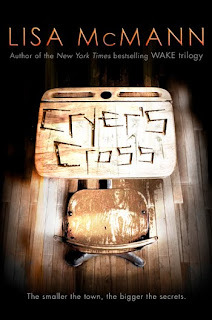 If I hadn't read the Wake series, I probably wouldn't have picked up Cryer's Cross. On the other hand, based on the reviews I've read and the summary of Cryer's Cross, the hardcover edition is probably a more accurate portrayal of what the book is actually about. Uh, yeah, definitely a disappointment. I would actually be less likely to pick this one up in a bookstore than the one with the previous cover. It's just too conformist with all the other YA out there.